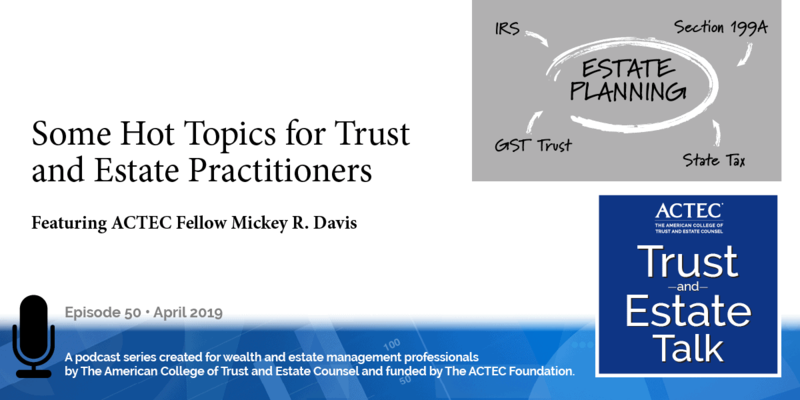 “State Law Pitfalls: Don’t Step in It When Your Client Steps Across State Lines.” That’s the subject of today’s ACTEC Trust and Estate Talk. This is Birch Douglass, ACTEC Fellow from Richmond, Virginia. With clients more mobile than ever, it’s more important than ever to draft to avoid common problems due to differences among state laws. 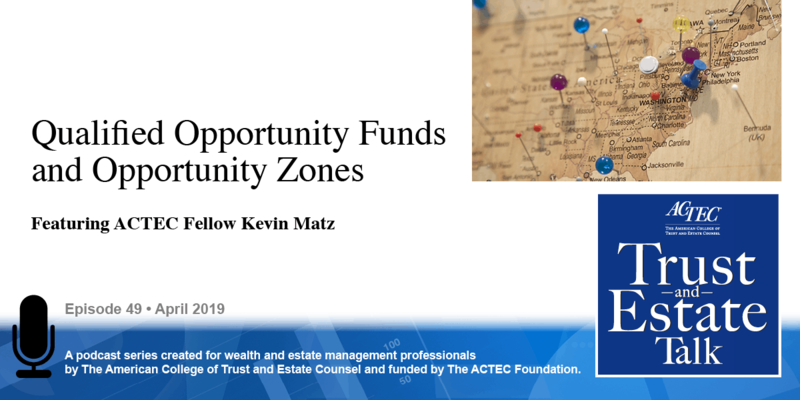 To learn more about this topic, you’ll be hearing today from ACTEC Fellows Professor Gerry Beyer of Lubbock, Texas and Katherine Ramsey of Richmond, Virginia. Welcome, everyone. Thank you. Our goal is to avoid unanticipated results when a different state law default rule applies –one which could even be 180 degrees different from your own state or even something that you would say is unbelievable or impossible under your own state’s law. Now let’s take a look at the importance of this. Clients move. 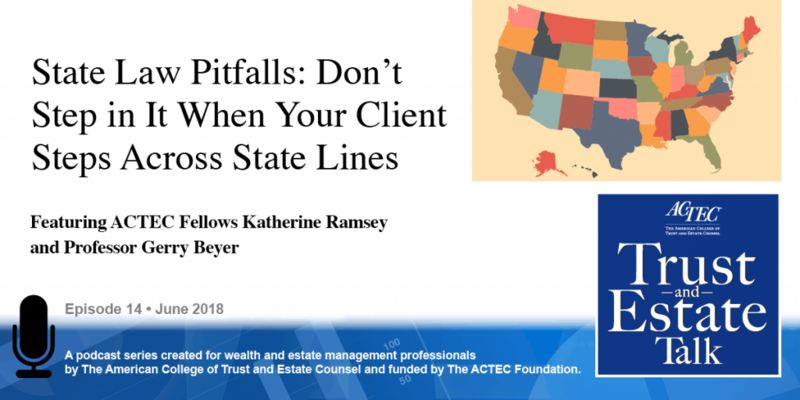 Almost 8 million people move to a different state each year, and many of your clients will own land in other states, so the odds are high you’re going to have different state laws applying to your client’s estate plan. Now, what governing law applies? Well, first we look at the real vs. personal property distinction. Personal property is governed by the law of the client’s domicile at death, whereas real property is governed by the law of the situs, thus the validity of the will and its interpretation may be under the law of several states, even if you have a client that doesn’t move. Another concern is property ownership. Does your client own the property that your client wants to give away? Thus we’re talking about a married client and marital rights, because ownership of property, assuming it can be traced, which is often difficult, is governed by the law of the domicile at the time the property was acquired. Absent agreement, marital title does not change as the couple moves between community and common law property states. Another situation would be will validity. 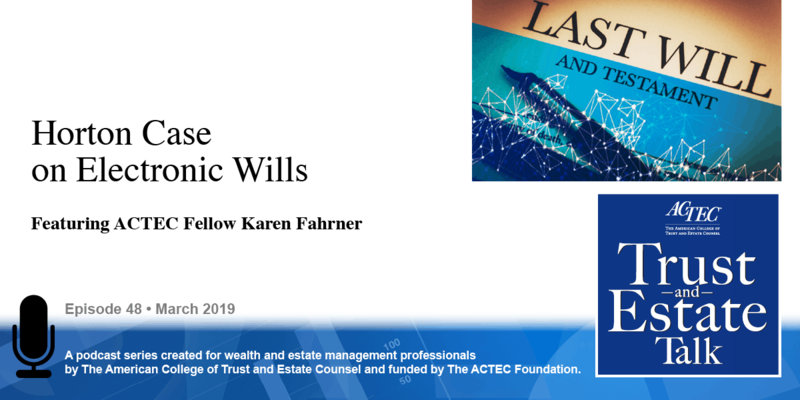 Now this one in the past used to be a big problem, but now there are saving statutes in almost every state which will protect a will from being invalid for failure to satisfy local requirements. And finally, we have interpretation and construction problems, because even if the validity of the will is governed by a home state, the interpretation and construction rules are going to be governed by the law of the jurisdiction under which the property passes. So, personal property will be domicile at death, and real property will be the situs of the property. Now, I do want to mention that there are a few cases that have allowed the court to look at the rules of the state where the will was executed, but that is not the norm. To solve this problem, you may want to include a choice of law provision in the will. Now, with regard to these changing rules, there are four main areas of concern. First, we have changes in circumstances to property: the rules regarding ademption, change in the value of securities, interest on legacies, and exoneration are very different among the states. Second, we have changes in circumstances – changes to people – the result of getting married or divorced could be very different. The way in which people are considered pretermitted children can be different, and the way in which lapse and the anti-lapse statute applies can also be different. And then we have interpretation and construction problems. How are ambiguous provisions handled? How do we determine class gift membership? Will a separate tangible personal property document valid in the state where executed work in a state that does not recognize such documents? And finally, we have estate administration concerns. 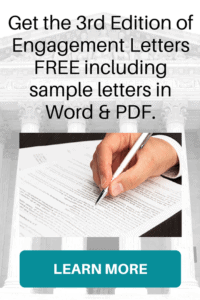 You need special language in the wills to authorize specific types of estate administration. Is bond presumed required or not? How is the compensation of the personal representative determined? So these are just a few of the very important things that you need to take into account. And now, Katherine Ramsey is going to give us a couple of very interesting examples. Thank you, Gerry. And you gave a great overview of the many different areas in wills that can trip people up as they cross jurisdictional lines. The same sorts of issues appear when we’re dealing with trusts and in other planning areas outside of wills or trusts. And it reminds me of a situation: One time, an elderly woman who lived alone, who had no family, no children, but she was the beneficiary of a trust that had been created 70 years earlier by her father, and at her death, the trust would pay out to the various beneficiaries under the document. A couple of whom were convicted felons, let’s say, and when Virginia law, which is the law of this particular jurisdiction changed to require notice be given to beneficiaries of the trust existence and so forth, there was a very real concern. In that case, we managed to work around it, but it struck me as a good example of how someone, an advisor, could have “stepped in it,” so to speak, if the trustee had come to them and said, “Well, I’m moving to another state, say Florida, and I need to move the administration of the trust to Florida.” And many practitioners would not have thought to say, “How would that affect the notice provisions under the Uniform Trust Code?” And as it turns out, it would have affected it tremendously in this case, because Florida, like a couple of other states, require mandatory notice. And so our beneficiary would have been very upset with her ne’er do well relatives finding out that they would inherit millions of dollars at her demise. Other examples, as you were mentioning: real estate – Virginia, for example, tenancy by the entireties is not presumed; you must actually state it. Same with survivorship between joint owners; you must state it. And that’s an area we frequently see drafters not cognizant of that if that’s not the rule in their own state. And finally, just as another example of traps, again using Virginia as an example, anatomical gifts in Virginia are presumed to be authorized unless the document says expressly that you cannot. So, as drafters, we don’t want to make assumptions; we need to draft for all possibilities if there are issues that are very meaningful to our clients. Well thank you, Katherine and Gerry for educating us on state law pitfalls.